Modelers who say this are evaluating the scale by HO and N scale terms and trying to fit it into that paradigm. A paradigm that often includes modeling the entire transportation sequence of building a train in one yard and taking it to the next. It also assumes as much physical distance and, in the recent past, as many action centers (towns, industries) as possible. While not everyone subscribes to this view, by looking at quarter-inch scale through this prefocused lens, these modelers conclude (often correctly) the scale isn’t for them, given their space and priorities. Judging one scale by the criteria of another is unfair but we do it all the time. It’s taken me several years to understand quarter-inch scale on its own terms and to wean myself from seeing this world through the HO lens. And, as nicely detailed as they may be, models sitting alone on a table tell a very incomplete story and I’ve often wondered whether presenting P48 in the context of a thoughtfully done cameo scene would make any difference in the perception of the scale’s feasibility. As a subscriber to the Model Railway Journal, I’ve become a fan of the high level design thinking that goes into British exhibition layouts. In contrast to our individual modules built to a core set of standards, these are privately owned self-contained stand-alone displays. Driven by the logistics of transporting and setting up such layouts, often singlehandedly, our friends have taken the designs into the realm of both art and science. For my purposes, I’m not trying to mimic what’s possible in HO or N, that’s a recipe for disappointment in this scale. My intent is to let the merits of quarter-inch scale speak for themselves. Therefore, I’m less driven by operations than I am with presentation. Even at RPM meets, no matter how detailed or accurate it is, watching a train chase its tail grows old very fast. Keeping these thoughts in mind, along with all the design and art stuff I’ve been harping on, I went trolling through my photos and stopped on this one from 2008. So, in terms of presentation, what do I see here? I like how the buildings and the overhead walkway/conveyor frame the scene and focus your attention on a limited area. Initially, I thought this would be a drawback but I’ve given the composition more thought and feel I have a solution. I like the way the street creates a path that leads the eye into the scene. Implied lines like this are how artists lead your eye through a composition and focus your attention. Notice the line created by the junction of the street and sidewalk and how it leads the eye back. 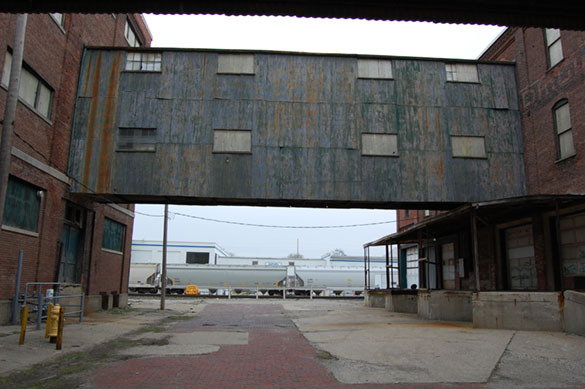 Though not seen here, at certain times on a bright day, the rail cars are spotlighted by the sun due to the shadows created by the buildings. This contrast between light and dark draws your focus to them. Contrast is another artist’s tool. There is a layering effect from the foreground (the street), to the middle ground (the tracks) and then the background (the white factory buildings) that gives a sense of depth. With the scene tightly framed on each side, there is a sense of mystery. You cannot readily see or know what’s coming next. This enhances the viewers’ engagement with the modeling. In other words, you’re curious about what’s around the corner. There are multiple sources of inspiration in a photo like this. Some obvious like the potential of the factory buildings and the wealth of detail and textures, while others aren’t so obvious. Though it may be hard to envision, I see the inspiration for a self-contained statement in these photos. With such a modest design, it’s natural to focus on the negatives of what you would supposedly sacrifice. I see an opportunity to speak with an intentional clear voice about a single aspect of railroading, namely car handling. By car handling, I’m not thinking of the typical obsession with waybills or car cards and all that stuff. I’m looking beyond the paperwork to the physical movements and procedures a train crew goes through to safely place a car where it needs to go. In TMC 05, Greg Amer, a railroad professional, outlined the steps his crew takes with setting out or picking up a car. With our hurry up, selectively compressed time and space mindset, many of these steps are simply ignored, unless the layout owner has purposely designed them into the operational workflow. I see the chance to bring such procedures into razor sharp focus by eliminating all other distractions. I see a project like this as an opportunity to present P48 in a proper context. One that informs first and, to a lessor extent, entertains. More thoughts and my specific design criteria next week. Working in the smaller scales, like my native N scale, the trains are just small. This isn’t a comment about whether or not really high resolution work can be done in this small scale (I know it can) but the trains are still small. As the real life human looking at them, it’s difficult to relate to them the way we do to a real train. It’s almost impossible to construct a scene where we’re looking from the ground upward to the side of the boxcar as our field of vision invariably wraps around the entire car from that single point. Since we can’t easily foster a relationship with our tiny models in the same way that we do with the real thing, we shift instead to modelling the train within the context of its place in the community and role; we model the train as a unit, then the railroad, and on and on. Indeed what impresses me as we move upward in scale is not that we can use that scale to inject more layers of detail and texture in the model but the way these bigger trains bring us closer to the ground. Instead of relating the whole train we can get closer to focusing on the individual car or locomotive. I’ve spent a lot of time watching videos of 1/32 scale model trains and each was amazed at how much I was drawn into the single model instead of where it was operating or what it was doing – “Now that’s an engine!” I’d exclaim. All of that to get to my point on how we could think of choice of scale in terms of the way it allows us to relate, as a viewer, to our work. Where in N modeling the transactions at the coupler (at that granularity) is difficult we really can consider this level in O. In your post, I think that’s the opportunity I saw in what you described. By using the larger modeling scale we can take the viewer and place them on that street. We can tease them down toward the trains and show them what’s going on today at the end of XYZ Street around this time on a Wednesday. It’s a another piece of that user experience discussion that describes our relationship with the model as a viewer looking at the piece from outside the scene long before we learn the story of what’s going on in the scene. Sure we can still add more nut-bolt-washer castings in O than we’ll ever do in N but the point is that in O you can bring the viewer deeper into the scene and on a more intimate level. Fascinating post as always Mike. Great reading over this morning’s coffee. Being more of the English style layout design fan,the first think that struck me is what am interesting twist to the fiddle yard. What if one could briefly glimpse the train before it appeared on “the main stage”. Matt: That’s a really neat idea…a really, really neat one! This would work with most staging yard designs. I’m also a fan of the British-style layout design. In the traditional “fiddle yard to terminus” style where both are in line than a lot of that shelf is offstage and your suggestion would really make something of this space. I wrote a post some years ago on this subject, touching on the same or similar points. A problem many of us have is the way we get locked into thinking that we have to model this or that (or this and that). Isolating one aspect (like switching or engine terminal routines) and focusing on that is a mindset few of us embrace. I guess we’re all afraid, or maybe conditioned, to the idea that we’re going to miss out if we focus that closely on only one thing. Could also be that a close focus doesn’t sell a lot of product either. Thanks Matt. Look forward to the progress on your own project. I’m glad you mentioned Greg Amer and his approach to switching. Greg & I worked together as fellow engineers for a few years before I left the industry. Regardless, the time I spent working on the railroad, those hours and days have made me a more discerning modeler and operator. A lot of the steps of moving a railcar are quite honestly boring when replicated in scale, but they are steps that we should model. Trevor Marshall, I think has done a wonderful job of taking some of these steps and making them enjoyable to an operator. As I start to plan my outdoor layout (1/29), I keep thinking about what aspects of scene, location, or composition I want to include and those that I want to exclude. Other hobbies (military modeling, airplanes, etc) all seem keep the idea that the model is only one player in a overall drama. Model railroaders, overall, I think tend to just think of the trains and ignore the ‘rest’. The ‘rest’ can be just as interesting and if not more important than the trains. Framing the trains into the scene is one such step. ve never worked on the railroad, I can’t imagine being stuck in the hole for half my shift or the accumulated hours spent waiting on a plant manager to decide where he wants the cars spotted, or for someone else to weigh in on the work. As long as we think of these as models with nothing more than play value, we’ll ignore such hurry-up and wait aspects, as we probably should. I couldn’t agree more about considering the rest of the scene. If the story is about nothing more than the train and what it does, then why even bother with the rest? Because (answering his own question) the context adds immense value to the narrative beyond the train. What I really enjoy about your posts is the comments, particularly your responses to the questions and points raised by others – this is truly a conversation, and definitely missing from elsewhere. As an example, two or three weeks back you brought the word “cohesive” into the discussion. Now you have added another “C”: context. I cannot but help wonder if these are the cornerstones of successful layout (not just the track) design? I would add a third “C”, but related to the construction of a layout: consistency. Consistent level of detail, consistent commitment to the execution of construction, and a consistent set of standards. (It is more important that things like the wheels and track are matched, than the actual gauge is perfectly to scale. However, working to “Proto:x” standards does make this the case.) This does not deny the possibility of improvement, but it means that as one’s skills tighten up, then earlier models may need to be upgraded, or even disposed of. I have a couple of friends who read your posts, but not the comments. Boy, are they missing out on things, as well as the whole point of your blog! Thanks Simon. I try to create an atmosphere for conversation, although with varying degrees of success. I disagree with the idea that the track gauge doesn’t have to be to scale. One compromise begets a multitude of others as those working in quarter-inch know all to well. I agree that the track gauge is a compromise that sometimes leads to more compromising. I’m having to make a huge decision to move from Gauge 1 (45mm track) with improperly scaled 1/29 equipment to something else (or sell everything and go P:48?). That something else, in my mind at least is to build properly gauged 1/29 track. This decision is very close to the 0 gauge/P:48 discussion that happens, but P:29 is simply in my imagination. I’m not willing to compromise selective compression of a building (for example I’ve got one structure that scales out to 160’x180′), so why should I compromise on the track gauge, or even turnout sizes? Thankfully the prototype I’m modeling has #9 & #11 turnouts so they can be reasonably accommodated. Having consistency in all aspects of the model making process is something that I think we miss out on. We are in a ‘rush’ to complete a scene without taking into account why or how this scene would be played out in real life. I’d add another “C” Connection to the real world… How does this model/scene reflect and build upon the examples we see everyday? I keep going back to the same thought that how we frame the discussion about the craft has a profound impact on the way we approach it. Toy trains instead of miniatures for example. This is why I’m particular with the terminology in my posts. To your idea of consistency, I’ve never understood the notion of 3-rail scale, where people claim that everything about the work is to scale, yet they are more than willing to accept the glaring anomaly of out of scale track and wheels. There are numerous other examples of inconsistent thinking for the sake of expediency and convenience. I’m curious, how many feet would a 160 x180 building cover in 1:29? I didn’t put my point very well, and it was also anglo-centric to a degree – see later. I am not saying that it shouldn’t be to scale at all. I am saying that the wheel and track standards need to be correctly balanced for good running to be possible, and the easiest way to do this is to follow the prototype, i.e. model the track to scale, too. That said, some approaches such as “EM fine”, as advocated by the Manchester MRS, and deployed to great effect by Pendon Museum and Geoff Forster, are not exact scale but can look as good as and frequently run better than P4. There is a different problem in the UK compared to the rest of the world: we have “toy” scale/gauge compromises, where the scale but not the gauge has been increased so that the distance over the outside faces of the wheels is roughly to scale. In hindsight, we have had it easier than you, with over-wide wheels (H0 and 0) and an over-wide gauge (0). It is patently impossible to model absolutely everything perfectly to scale, but the closer we can get, the better looking and running will our models be. Thanks for the clarification Simon. I consider a correct track gauge a fundamental. If a manufacturer or modeler can’t get that right, I see no point in worrying about the rest. I’m well aware that we’ve been inflicted with numerous “solutions” done for the sake of expediency and to make use of existing (and expensive) tooling. As I stated earlier, this one compromise sets off a never-ending string of other compromises. Where do we draw the line? And, if we do draw such a line, it’s likely to be an arbitrary choice. As you pointed out, this is more problematic in some scales than others. Quarter-inch will always be hamstrung by the volume of legacy gauge equipment floating around the marketplace, not to mention the separate mindset of the 3-rail faction. This is why I feel P48 needs better exposure, especially to those who are prototype oriented in the first place. Believe me, when serious modelers see it, the gears start turning. The major hurdle is the tradition bound ideas of what a layout is and is not. Or should I say, has to be, in order to be satisfying. I think though, that cracks are beginning to appear in the old school mindset. People in their thirties and forties are less likely to stay in one place for twenty years like their parents might have. The idea that you’ll have to work on a monster layout for that length of time before you can even begin to enjoy it is wearing thin. And what if you do move, once or multiple times? You start over at zero again and again. To all my critics and the big media pundits, I have the same question: how sustainable is this way of doing the craft? How healthy is it for the industry and for the individual over the long term? 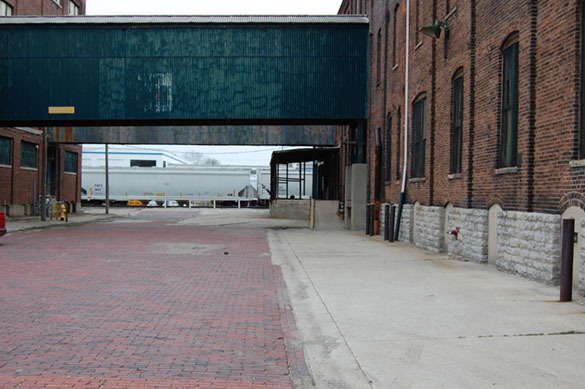 A 160′ x 180′ main building stands at 6’x 7′ without the additional building across the street (a mere 60×60 brick structure separated by a 2 lane road), nor the 12’x 24′ unloading shed over the tracks. I’ve built it up of 1/8″ styrene so it’s fairly light. I once figured out that if I modeled the one station/town area that includes the feed mill I’d need a space of 50-60′ by 15′ to do the scene without selective compression. Those numbers are quite large, but it’s outdoors so it helps a bit. When people ask or I tell them about my hobby, I describe it as “an outdoor, scale model railroad”. Here’s my blog post (not updated in a while) about the feed mill. In the UK, owning one’s own house is a very common aspiration, but the crowded nature of this island means that there is a shortage of housing, and basic supply and demand economics makes property very expensive: ’twas ever thus, but it just gets worse. As a consequence, moving house to get “further up the ladder” is quite common, and housing tends to be quite “compact and bijou”. This has put space at a premium, so the idea of small, sectional and portable layouts is commonplace. This also means that many modellers build a series of small layouts, each one an improvement on the last, and often to finer standards. A great example from the 1970s is Ian Futers, who built a series of layouts following a connected theme, and moved from “universal” H0 track, to hand built P4, via finescale 00 and EM. Much of the rolling stock was re-wheeled and further details added as his confidence and skills progressed, and at one stage he was producing a new layout each year: this is an extreme example. Most modellers tend to have a slightly longer timescale, maybe a layout a decade. They thing about this progression was that a series of small layouts enabled the build up not just of skills, but more importantly of confidence – a theme which comes up frequently in your posts. I like your point about how a series of small layouts supports a constant growth in terms of skill and that, with each, they represent the builder’s current work. If you didn’t replace the layout frequently how would the current work reflect that or does it become a little less homogeneous in terms of finish where the section completed most recently showcases the talents now mastered and the remaining is not quite at that standard…yet.